I was raised to believe―really, truly believe―that all people are created equal. That preconceptions about gender, age, creed, race, or sexual orientation are artificial and simply don’t matter. And I also believe that people can learn, over time, to see the world this way. All the different species in my fantastical world get along with each other. Of course, individuals don’t all necessarily adore or even respect each other (where would the conflict be if they did? ), but species co-exist in peace and equality. All sexual orientations and sexual identities are accepted without prejudice. Now, I fully acknowledge that prejudice is a complicated thing, and a world without it is probably unrealistic. Therefore, I allow some of my characters to have preconceived expectations about people different from themselves. And, maybe even more importantly, I allow my characters to doubt themselves. After all, much of the bigotry and bullying in the real world is tolerated or even allowed to flourish because people don’t stand up for themselves and declare it unacceptable. Webrid, the main character in Green Light Delivery (and its upcoming sequel, Blue Diamond Delivery) is a species called a Yeril. He’s large and hairy and works pushing a handcart around the city, making deliveries or selling wares on consignment. His mother did that, and so did his grandmother. It comes up often in his dialog and thought that he considers Yerils unintelligent and unambitious. When, a few times in Green Light Delivery, he learns about Yerils who have excelled in intellectual fields or traveled far and wide, he has a lot of trouble believing it. But he learns. By the end, he realizes that, while he may not be the brainy type, and he really would just prefer to stay home with a bowl of his favorite booze, there are people who look just like him who are ambitious to a fault. Anne E. Johnson, based in Brooklyn, writes in a variety of genres for both adults and children. Her short fiction has appeared in Drunk Monkeys, Shelter of Daylight, The Future Fire, and elsewhere. 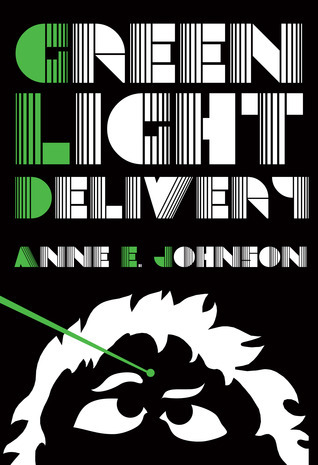 Her science fiction novel Green Light Delivery was published in 2012 by Candlemark & Gleam. Its sequel, Blue Diamond Delivery, will be released in June, 2013. Anne also writes novels for tweens. Learn more on her website, http://anneejohnson.com. Green Light Delivery can be purchased directly from the publisher, on Amazon, and at B&N.